6 hole corner connector. 1-5/8" fitting width, 9/16" hole diameter, 90 degree connection. 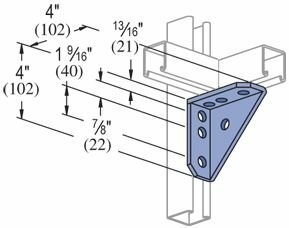 Heavy duty Unistrut angle bracket made of steel, zinc-plated. • Trade Size: 9/16 in.